Michael Jackson's children Paris, center, and Prince Michael, right, are expected to accept a lifetime Grammy award Saturday. 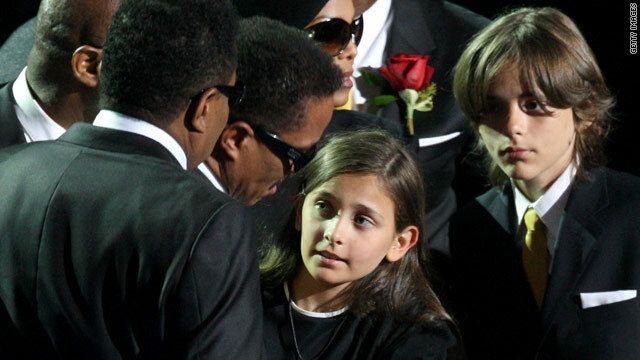 Los Angeles, California (CNN) -- Michael Jackson's two eldest children are scheduled to take the stage this weekend to accept the Grammy Lifetime Achievement Award for their father, Jackson family sources said. It would be the first public appearance for Prince Michael, 12, and Paris, 11, since their dramatic appearance at the memorial service 12 days after their father's death. "The whole world is waiting to see these children blossom," said Brian Oxman, a lawyer for Joe Jackson. Two sources close to the family said the youngest, 7-year-old Blanket, was not expected to appear, although they suggested that might change. Contrary to some media reports, the sources said there was no plan for the children to sing or dance at the show. The Recording Academy, which presents the Grammy Awards, will honor the late pop star with a Lifetime Achievement Award at the Special Merit Awards ceremony Saturday evening in Los Angeles. Video of the presentation is likely to be included in Sunday night's musical tribute to Jackson during the Grammy telecast, the sources said. While Katherine Jackson, Michael's mother, is expected to attend, Joe Jackson, his father, decided not to go because of his anger over the behind-the-scenes talks that led to the agreement to have the children accept the award, family sources said. The decision came just this week, after Katherine Jackson, the legal guardian of the children, complained to Grammy producers that no family members had been invited, the Jackson sources said. Two sources in the family said that she was initially told by producers that the estate's special administrators would decide who would take part in the Jackson tribute. "Can you believe this crap?" one source quoted Joe Jackson as saying when he heard that. The Grammy producers have not responded to a CNN request for comment. A spokesman for the estate administrators said the matter was for Grammy producers to decide. "Why is a stranger making family decisions?" asked Oxman, the lawyer who is representing Michael Jackson's father in a legal battle with the administrators. Oxman said those administrators have disconnected the Jackson family from any decisions involving Michael Jackson's legacy. Oxman was in a Los Angeles court Thursday where a judge set May 26 as the date he will hear testimony in Joe Jackson's request for a monthly allowance from his son's estate. Joe Jackson, 80, said he depended on his son's financial support for years before his death. The administrators, lawyer John Branca and former music executive John McClain, contend he has not shown how he was "actually dependent" on Michael Jackson. The estate lawyers said the expenses Joe Jackson wants covered by the estate -- including vacations, air travel, assistants and legal fees -- are not reasonable. They also noted that while Jackson's mother and three children were named as beneficiaries in his will written in July 2002, Joe Jackson was not. Joe Jackson is challenging the validity of that will, which names Branca and McClain as executors, but so far the court has refused to hear his arguments. The judge overseeing probate of the will already awarded $60,000 in monthly support for the three children and $26,000 a month for Katherine Jackson, starting from June 25, 2009, the day Michael Jackson died. CNN has learned that Katherine Jackson has not received any of the money ordered for her because of a judgment in a lawsuit nearly two decades ago. A South Korean newspaper, the Segye Times, sued Michael Jackson in 1990, claiming he failed to perform at a series of concerts they had already paid him for. The lawsuit also named Katherine Jackson, Joe Jackson and another one of their sons, Jermaine Jackson. Michael Jackson's lawyers reached an out-of-court settlement with the newspaper, but his parents and brother did not. When they failed to fight it in court, a California judge issued a $4 million summary judgment against them, which has now grown with interest to about $8 million, according to court papers.